I get very disturbed when there are natural calamities. Who doesn't get affected? The memories of Cyclone Phailin, in Odisha on October 12th, exactly a year ago, are still fresh in my mind. When I first heard the name of the latest cyclone- HudHud, being the HUGE Hindi Movies Fan that I am, I remembered the title song from the Salman Khan starrer- Dabangg. In Hindi, the word Dabangg means fearless. No doubting the power of Cyclone HudHud Dabangg. It had started making its presence felt much before its arrival. 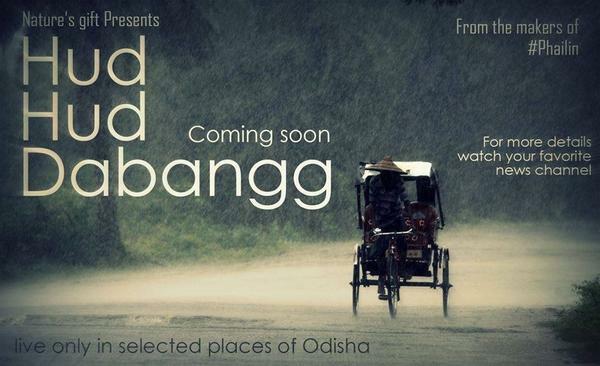 "Coming Soon to Odisha & AP. Nature's Production & Direction-From the makers of Phailin." Sadly, we had no choice but to anxiously make preparations for HudHud's visit. Wish I had a HUGE hood! I'd cover up #Cyclone #HudHud. Bash it up & render it weak. Neither Odisha nor AP it can seek! Recently my Blogger-friend & Soul-sister, Shweta Dave shared her cool Limerick- What did you think on her Blog & I was inspired to compose another Limerick so that I can share it with her! Here is my Limerick, Shweta! Amrita, your words were prophetic. HudHud indeed trends on Twitter now & hogs the media & mindspace today. We had visited Vizag last week. It was lovely to see the Sunrise . We had a great experience at Simhachalam Temple last weekend. May the Lord save us from natural calamities. May there be no disasters in our cities. Lord Nrusinghanath is the presiding deity of the Simhachalam Temple, Visakhapatnam, Andhra Pradesh. Maa Tara Tarini Temple in Berhampur, Ganjam, Odisha is one of the four most important ShaktiPeeths of India dedicated to Maa Shakti i.e. Maa Parvati. We visited Maa Tara Tarini Temple too and I will share pics and info in my Blog soon. I believe that all will be well. 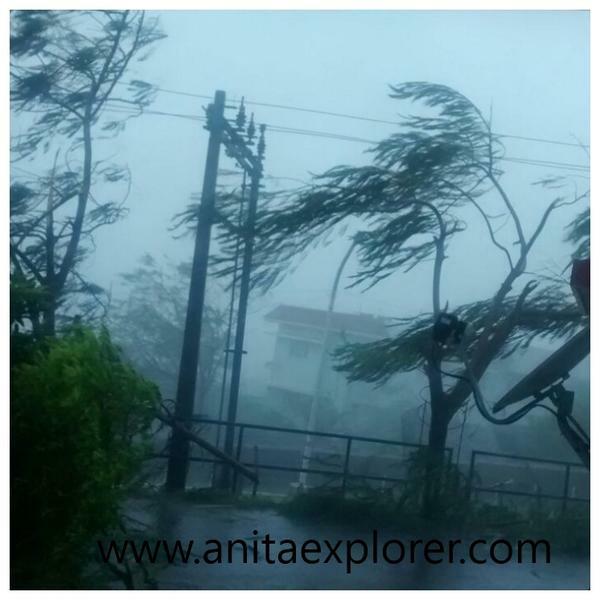 Here are some HudHud pics that my brother-in-law has shared from Vizag. They had visited the Yarada Beach last evening. My sister and niece posed for pics at the Yarada Beach last evening. Today morning we were in touch. 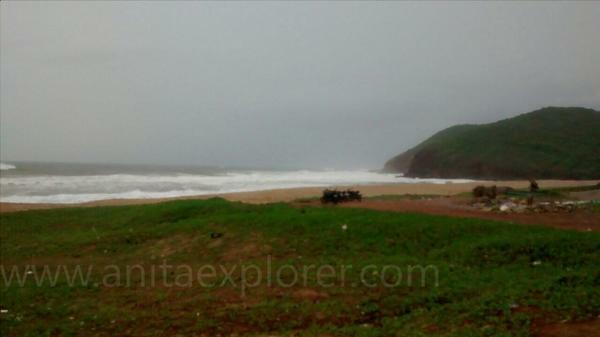 My brother-in-law sent the following pic just before landfall in Vizag. Unable to establish contact with them now as communication has been hampered. Management. Found many people actively sharing the Helpline numbers in Social Media sites. Hope there is quick restoration of facilities like electricity and communication-systems soon. We can't beat nature's power sadly and somewhere scientifically (I am not sure) aren't we responsible for some too? Amrita has also shared the same in her rhyming tweet above. In a Limerick- Lines 1, 2 & 5 have to rhyme & so do 3 & 4. Yes Mani. Hope all is fine soon. Really touched soul-sis, May the calamity walk away as soon as it can without any damage to a soul. Your post and limerick is unique and will generate a lot of good faith and prayers. Very scary, I pray for peoples' safety there. Yeah, with Hudhud the normal life has been thrown completely out of gear with the high speed winds! Hope people are safe and sound and it passes by soon! Nice limerick! We all hope & pray. Thanks Anita 4 featuring my tweet & mentionin me on blog! :) Yes, in front of Nature man is nothing. Possibilism is due to man's advances in technology & taming Nature, but then ultimately- Nature rocks! She knows hw 2 get back at greedy, callous humans. And gets back hundreds of times more ferociously. Still foolish man that he is- never learns any lesson. Superb pics. Thanks fr sharing! My pleasure, Amrita :) Thanks! No matter how much humans have progressed, the nature still reigns supreme! Only now we can defend ourselves a little better with advance warnings ! Yes Rahulji. Thanks for sharing this. Technology may not STOP calamities, but does fore-warn & that's a big help as it aids in evacuation & calamity-ready preparation. Nature is the supreme power is not it ? Nature does have a lot of power. 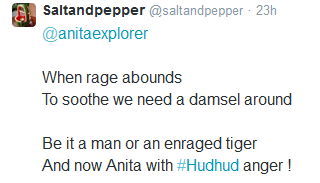 Interesting and unique take on Hud Hud, Anita. Hope all's well at your end. Thinking of all friends in Odisha as the cyclone rages. HudHud has taken a heavy toll on AP & Odisha. Our administrative machinery has to work over time to set things right. Electricity & communication-systems need to be restored. We actually cannot stop natural calamities but yes we can alert the public in advance. But the saddest part is many a times it has been seen and investigated that our respective authorities have failed in passing information on time which results in huge loss of life forms. Hope all will be fine. True, Priyashi. Alerting the public is much needed. "Being forewarned is being forearmed". Firstly Glad to hear from you! Nature just shows how little humanity is! Just anticipate....that is all we do. My brother is in Jharsugra now, content that nothing happened there. Bhubaneswar is not affected much this time, except for the inflation! Glad HudHud Cyclone's effects aren't as dangerous as Phailin. that photo made me shudder. May God be with us. Yes Red. That pic is scary. We all hope & pray, Anunoy. Thanks for sharing such a valid point, Sindhu. Very true. I totally agree. We have to use the knowledge & ensure that such floods and other disasters aren't repeated. HudHud has badly affected 80,000 homes in Odisha. Do hope we can reduce such damage in the future.